I guess I knew that there was no possible way that this panini wouldn't be delicious! The only reason I was "ify" about it, was that it seemed out of season....this is more like something I would make during the fall (maybe because of all of those leftover turkey/cranberry sandwiches after Thanksgiving). My secretary Theresa made the most wonderful blackberry preserves! SO AMAZING! 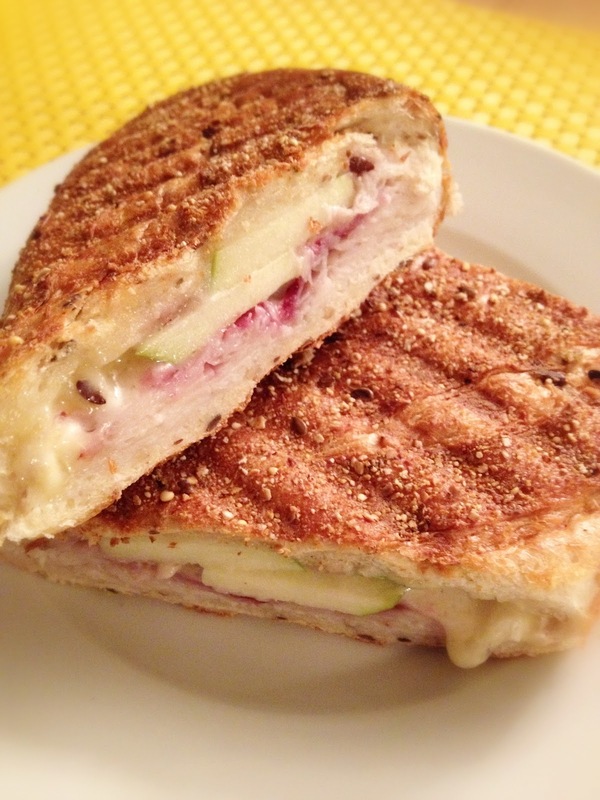 Blackberries are my favorite, so I thought why not incorporate them into this panini!?! All I did was put thinly sliced turkey, brie cheese, granny smith apples, and some of the blackberry preserves onto multigrain bread and press it with my handy-dandy panini press until the bread was crispy, and the cheese was "melty". If you don't have a panini press, you can just put it on a pan and press down with a plate, flip it over and press the other side. Sometimes I am amazed by how just a few simple ingredients can taste like a gourmet meal!